By Jacek Staszak and Mateusz Mucha. How much time do I waste on social media? How does Social Media Alternatives Calculator work? How to quit social media? Why abandoning social media is a good idea? How do you get addicted to Facebook, exactly? Social media is an ever present phenomenon. In 2015, Deloitte research found that Americans check their smartphones 8 billion times a day. We can only imagine that by 2017 that number has risen significantly with smartphones being the first thing we look in the morning. More often than not, our phones have news to share with us with plenty of push notifications coming to home screens. If we dive we dive into the world of social media, we spend plenty of time there. We know we can use it more productively. Like with cigarettes, just one doesn’t do much harm. But a whole pack means plenty of lost money and health. And in the case of social media - lost time. Many of us ask themselves about how that time can be used more productively. We’ve got the answer. 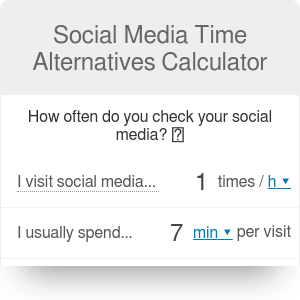 On our Social Media Alternatives Calculator, you can check how much time you spend on social media every day, week, month and year. Time is precious, and you can use it much more productively. There are gazillion things you can do instead of scrolling for hours. We’ve picked a couple of them that shows how much can you achieve if you quit social media now. You provide the number of social media breaks during an hour and average break time. We give you the answers: how much time you spend on social media cumulatively and how you can use it. We translate those hours spent on books read, calories burned and the time required to master a skill. We found formulas and constants that helped us transform time into stuff done, for example, minutes required to read an average page of the book or Metabolic Equivalent of Task that measures the energy needed to perform an activity like jogging or walking. Just a couple of five-minute breaks every hour are hundreds of hours yearly. You cut your social media time by half, and you still get plenty of time to read, run or earn money. Easier said than done, so we’ve got a couple of tips for you. Getting rid of all your accounts apps is hard. After all, it’s the primary place for getting in touch with your friends. But you can at least cut 75% of your social media time with no side effects (losing contact with your close ones) whatsoever; you just avoid pointless scrolling. And do it instantly. Nothing gives you more urge to pick up your phone and open Facebook or Instagram than a hint that a mutual friend of your colleague has commented on a post. Apps want your attention and notifications are the best way to get it. And if you open them, you can find yourself 20 minutes later still on Facebook. Not reading a book or working. In July 2017 WIRED magazine wrote that notifications take away user's control over their phone. In a sense, it’s them that dictate how often you should use your phone and not you who does it. So go to „Settings” and try to disable notifications in as many apps as it is possible. Leave enabled only those that are essential, so probably messaging, phone and e-mail. Everything else is just time-wasting. Some might still feel the need to check social media every once in a while even with notifications disabled. The remedy to that is simple - deleting the apps you feel addicted to. How many times it’s your instinct to open the Facebook or Twitter app while commuting or waiting for someone? Not only does it take your time (which you can use better like reading a book), but also makes your mind less sophisticated. Do you honestly need all your social media available with just a couple moves of your thumb? Most social media are also available on a desktop. Probably nothing will happen if you check it only at home. A long, long time ago mobile phones were used mainly for calling. If you wanted to talk to your friend or family, you just dialed their number. Text messages and now Snapchat changed the landscape of social interactions. But texting can be addictive. Every single time you get a message, your brain releases a hormone called dopamine, which gives you an instant pleasure. Sounds familiar? You love that notification sound and the view of someone writing a message to you, right? In fact, you love that shot of dopamine that follows. You wait for someone’s reply and jump into other conversation, you talk about various stuff and spend hours talking to people without anything happening. Calling can also take a lot of time, but if you have important stuff to say, it’s better to hear somebody else’s voice. Keep it real. Have you ever tried to avoid any social media interactions? No snaps, no photos, no texting, no twitting? It can be healthy to keep away from your phone and computer for a while. Just do it for a day, maybe for just a couple of hours. You will soon realize how much you can achieve without all those apps bugging you. Enabling your „silent mode” gives you a perspective that you rarely get when constantly checking social media. It might become a habit of opening all those apps just once in a day. The beginning is hard, you might be successful in your fight against the urge to check your phone for just a couple of hours, and then you find yourself reinstalling all of the apps next morning. It’s natural that cutting on something so embedded in your everyday life can be difficult. If you cannot maintain your resolution, always try to get back to it. There are many benefits to social media. We get to talk to our friends easily; we can instantly know what’s happening in the world, find people with whom we share same interests or even fall in love. But social media have a different, much darker side. And there are plenty of studies that focus on how social media affect our brains, relationships, and productiveness. And conclusions are mainly negative. Researchers have shown that our brains behave the same way while using social media like when drinking alcohol or smoking a cigarette. According to YouTube channel AsapSCIENCE, a human brain that gets constantly stimulated by checking social media is being rewired into a dangerous direction. People glued to their phones are much worse at multitasking and performing a single task is not easier. Concentration problems and social media addiction go hand in hand. For every word written, a code built or decision made, there are minutes spent on social media. It's also much harder to concentrate on real conversations when there's plenty of them on the Internet. How many times have you seen a couple on a date looking at their phones, not at their partners? Maybe you're guilty of that also? Social media lower our self-control. Studies have also shown that people addicted to social media are more prone to impulse spending and eating. It's not hard to go binge-shopping after seeing all those perfect lives on our timelines, after all. To sum up: we are worse at our jobs, relationships and decisions. Using Facebook or Twitter does not require much energy, you just turn on your phone or type the address in your browser. We crave the information that is inside timelines and walls. And when something is easy to get, it quickly becomes our second nature. Relief comes fast when you find out about everything that happened while you were offline, even if it was just five minutes ago. Other studies, quoted by The Guardian, compared social media to gambling. Every shared photo, link or post is a gamble on how many likes one can get. It’s a game with no guaranteed success, and that pulls people to using it. Additionally, we release much more dopamine when we talk about ourselves, which is, in fact, the essence of social media. All of that makes social media so addictive and dangerous. Jacek Staszak and Mateusz Mucha. Social Media Time Alternatives can be embedded on your website to enrich the content you wrote and make it easier for your visitors to understand your message.